Too bad Marlon Brando isn't around for the Vancouver 2010 Winter Games, as the Olympic City apparently has a new streetcar named "FLEXITY" set to open -- and operate free for several weeks -- connecting downtown Vancouver visitors with just about everything on the waterfront. 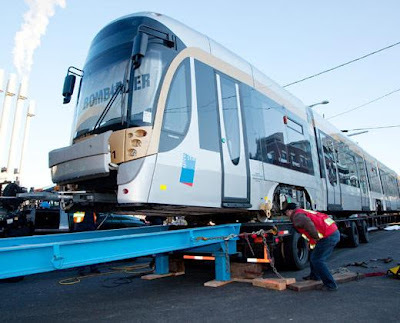 According to the city's website and fact sheet, this spanking new Bombardier vehicle will quietly and cleanly wisk winter sports fans (and everyone) along the Olympic Line at no charge from January 21 to March 21 -- 60 days of not taking the bus. This is good news for the thousands of likely carless-in-Vancouver visitors descending on B.C. Loving that the Olympic Line treks right up Cambie Street (site of my office). Bravo! Hey, Stella -- see you at the FLEXITY station!